As an avid traveler, over the years I’ve learned what my essential travel beauty products are. 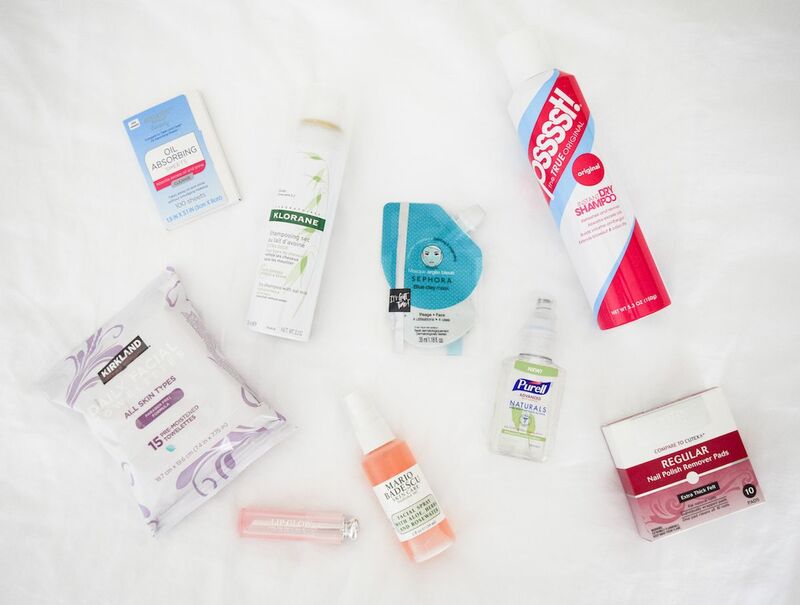 While it’s easy to amass a large collection of beauty products at home, when traveling, one needs to be a bit more selective when deciding what to bring. After all, there’s a limited amount of suitcase space available. Personally, while I love my beauty products, I won’t prioritize my make-up over my clothes. Not to mention, there’s those pesky liquid limits that prevent you from bringing full-size products. So with those things in mind, I try to purchase travel size beauty products and only bring the essentials! Pro Tip: Buy the travel size of your favorite beauty products, but keep the bottle so you can refill it when you get back home. It’s cost-effective to refill rather than to re-buy. 1. Oil-Absorbing Sheets – Oily skin is a huge problem for me when traveling, and luckily, these sheets soak up any excess oil on my face in a few seconds flat. They come in a package the size of a small business card case, making it super easy to pop into my handbag. 2. Dry Shampoo – Dry shampoo is a lifesaver when traveling. It saves me time in the morning, and as an added benefit, gives my hair a nice volume boost! My favorite dry shampoo is by Klorane, but when money is tight, I opt for this cheaper version! 3. Setting Spray with SPF – Since I try to get up as early as possible to photograph during the natural daylight, SPF is a must for me, as my face is exposed to harmful UV rays for many hours! I love this setting spray which allows me to wear makeup and still protect my face from sunburn! 5. Nail Polish Remover Pads – If you paint your nails often, you should also think about getting nail polish remover pads, so you don’t have to worry about liquids! These things are a lifesaver for long-term travel! 6. Sephora’s Easy Smoky Eye – Need a dramatic look without bringing eyeshadow and a brush? Grab this two-in-one smokey eye from Sephora for the perfect nighttime look in half the size! 7. Avocado Mask Sheet – While I may go for a fancy mask at home, when traveling it’s easiest to use a peel-away mask sheet that I can toss entirely when done. The Sephora mask sheets come in individual packaging, making them perfect for travel! 8. Tinted Lip Balm – Tinted lip balm is my go-to lip color for keeping my lips hydrated and flush with rosy color at the same time. While I love the matte look, it isn’t as practical when traveling, so tinted lip balm is the answer. It’s also super easy to apply without a mirror, making it the perfect solution for on-the-go lip color. Dior Lip Glow is my favorite. 9. Lip2Cheek Lip & Cheek Color – For a two in one, lip color and blush, try the Lip2Cheek Lip & Cheek Color from Nordstrom or Sephora. 10. Hand Sanitizer – Ok, so maybe this isn’t a beauty product per se, but getting sick while traveling isn’t a great way to stay beautiful. So, travel-size hand sanitizer is a must for me when traveling. Airplanes are some of the germiest places so generous application is best. I travel with Purell. I also keep the small bottle it comes in, and when it runs out, I refill it from a larger bottle at home! 11. Facial Mist – I was always skeptical about facial sprays until a coworker gave me this one as a holiday gift, and since then, I’m sold! A refreshing blast of rosewater is just what I need after a long flight where my skin gets dehydrated. It’s also super convenient to just whip out and spritz. No application process or messy clean-up involved. I recommend a rose water facial mist like this one from Sephora. What are your favorite travel beauty products you can’t live without when traveling?